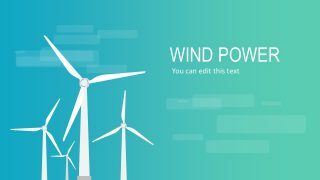 A wind farm is one of the terms used to refer to a collection of windmills that use wind power to turn an internal generator. It is usually located in especially windy areas, such as coasts and hillsides to gain maximum power from the wind. This is one of the principal features of the template. 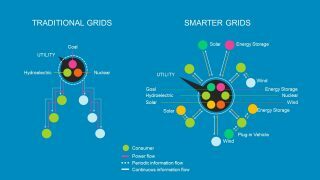 It is useful in showing several concepts related to renewable energy. 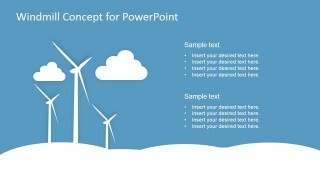 The PowerPoint design resembles a cutout overlay that creates a windmill. 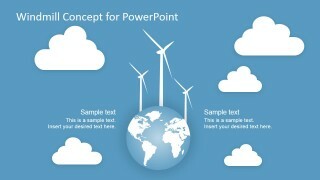 The vector image of the wind turbines can be used to feature the concept of renewable energy. 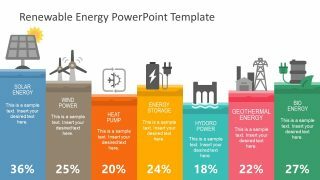 Several slides can be used to discuss how this type of energy relies on natural forces to generate power, and in turn, electricity. 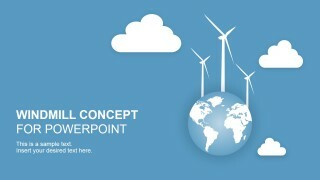 The presenter can lay down renewable energy sources and showcase the pros and cons of using wind energy. The availability of materials and location can be discussed, as turbines need a great deal of room to operate. Another issue is that there are not enough people who are qualified to manage and maintain these turbines. Some investors may hesitate in wind energy as business investment due to the high costs of producing and installing the turbines, as well as hiring contractors and engineers. Thus, the presenter can convince venture capitalists to invest in this type of business. The slides will aid the presenter in discussing all issues involved in an interesting way. 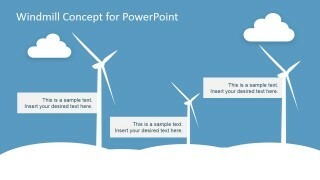 The PowerPoint objects are fully customizable and can be modified depending on the specification of the presenter. Using the simple and effective Windmill Concept Design for PowerPoint graphics, the presenter can create a presentation that is informative as well as pleasing to the eyes. 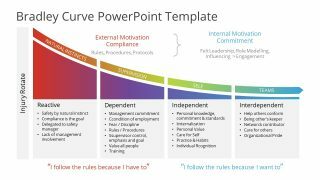 The presentation itself can be aided by downloading other related PowerPoint shapes from our PowerPoint Templates Gallery.